Streed quietly arranges the interior of a small room. 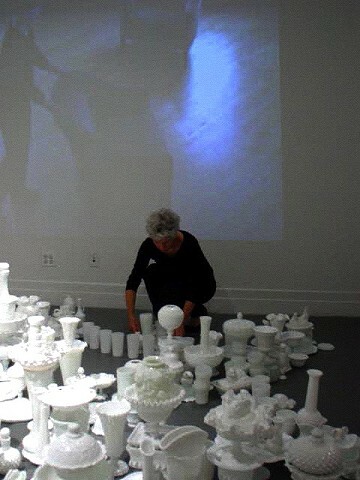 Vintage milk glass pieces collected over the past ten years becomes the muse for this video/object interaction. A mandala emerged and a video projects an image of a woman relentlessly seeking an arrangement of two chairs. Some history: Milk glass is one of the most inexplicable, ubiquitous products to come out of the industrial age with its designs mutating well into the 20th century. First produced and marketed to the middle class homemaker as a substitute for more expensive porcelain. The constant shuffling and repositioning on tabletops and in display cases was a means to finding the perfect arrangement. Mandalas are constructed as contemplative supports by many cultures both ancient and present to act as a passage into knowing the unknowable. Carefully arranged from various materials and generally circular mandalas offer access to what is not visible. The mandala and the domestic activity pursue an outcome if we can just realize the right arrangement.